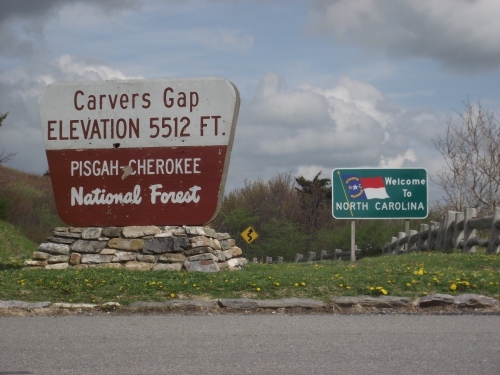 Carvers Gap has an elevation of 5,512 feet. It's on the top of Roan Mountain in the Pisgah-Cherokee National Forest. The photo was taken while looking at the North Carolina side of Roan Mountain from Tennessee. Driving distance to Carvers Gap is just under 10 miles from from Roan Mountain State Park. The park itself offers camping by RV or tent, hiking, swimming, a visitor center with gift shop and other outdoor recreational activities. The popular Appalachian Trail crosses the Overland Victory Trail at the top of the mountain. Roan High Bluff and Roan High Knob and both located to the west of Carvers Gap. To the east, Grassy Ridge comprises three of the mountain peaks. area. It divides the five mountain peaks into two sections. Here, there are few trees so the view is fairly unobstructed. It is a good place to stop and photographs. I was told that the Rhododendron Gardens here are a 'must see'. It's reputed to be the largest area of natural Rhododendrons in the world. The flowers peak in June. Unfortunately, the gardens were closed while we were there.We never did find out why. From this point at Carvers Gap, it's not too much farther to 'America's Favorite Drive' known as the Blue Ridge Parkway by car. This famous drive stretches from the Great Smoky Mountains in North Carolina to Skyline Drive in Shenandoah National Park in Virginia.